Most artists usually use a specific brand of oil paint for their artworks. However, if you’re just starting out, it takes time and experimentation before you discover your own preferred brand. When choosing the best oil paint for your art pieces, you should always consider the color, consistency, and price of the oil paint. There are tons of oil paints available in the market today and the price ranges from cheap, average to expensive materials. You should always be wary of inexpensive oil paints because they are usually made of low-quality ingredients and appear more saturated. This may affect the quality and output of your design. This is why it is always best to research the products and read reviews online to give you an idea what and what not to buy. In this write-up, we’ve rounded up the most popular oil paints and listed the pros and cons of each product to help you decide which oil paint may suit you better. An oil paint is a popular choice among artists whether you’re just starting out, building it as a hobby or using it on a professional scale. Oil paints vary in types, quality, and cost. It can be a bit confusing especially if you’re a beginner and you have no idea where to begin. Here are some tips on how to pick the right type of oil paint for your artwork. First, you need to identify the purpose and canvas of your design to narrow down the choices. Student Quality Oil Paint – This type of paint is generally cheaper. Although the quality of the paint may be fine, the material used includes synthetic substitutes to help lower down the cost of the paint. The colors are standard but not as rich compared to an Artists Grade. The color selection is also a bit more limited. A Student Grade oil paint is a good medium to start with especially if you are new to this craft. Artist Quality Oil Paint – This type of oil paint costs more and often double the price of a Student Grade oil paint. On the bright side, an Artist Grade oil paint has a wider range of color palette and contains high-quality and pure pigment. This type of paint will last you a very long time. The colors are more vivid and intense. The Artist Grade colors are usually categorized into a series of numbers or letters. The higher the letter or number, the more expensive it becomes. When you’re working with oil paints they tend to stay wet longer. However, working on a wet paint can actually provide a smooth transition in your artwork. Also, because it is slow drying, oil pants are excellent for mixing colors and creating unique blends. When you’re painting on a canvas, the color of the oil paint may change once it gets dry and absorbed by the material. It can appear a bit dull if the paint film lacks oil in it. If you’re creating layers, you may opt to thin the paint with turpentine to soak up the oil. This also reduces the drying time of the paint while giving your artwork a nice color. The Colore Oil Paint may be suitable for budding artists and professionals. The paint is manufactured with premium professional grade materials and can make any piece of artwork look professionally made. It is infused with super pigmented, bright, and vivid colors that are very attractive. I bought this set as a starter kit for my teenage daughter. We were both pleased with the variety of color choices that came with the kit. She tried mixing and blending different colors to achieve a unique hue. The result was delightful because even the combined colors produced a rich and dynamic tone. A small amount of paint can cover a large area. Therefore a tube can go a long way. The colors remain consistent even after application. Since it is made with high-quality non-toxic ingredients, the paint doesn’t peel or chip off. The consistency of the paint varies. Some tubes have a thick and creamy consistency while others are more fluid making it a bit difficult to apply. 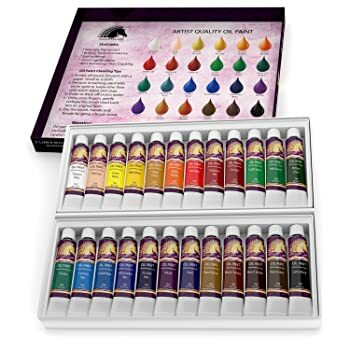 The MyArtscape Oil Paint Set may be appropriate for artists who prefer working with professional quality materials. With its high-grade quality, the colors are very rich and vivid even when mixed with other paints. Since it is infused with strong tints, any color will maintain its original hue even when it’s blended with white paint. This paint set has a solid performance. I’ve been using this for months and it remains consistent in terms of function. The consistency of the paint makes it easy to apply on canvas. There is plenty of paint in one tube so you can maximize the colors and use each tube as much as you need. The density of the pigment produces a high-quality paint. This 12-piece paint set makes it easy to transport during your travels. Some of the tubes have separated paint fluids. The paint has an overwhelming smell making it harder to work with, especially since my nose is very sensitive to strong odors. 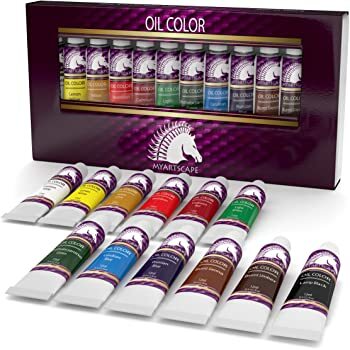 The US Art Supply Oil Paint Set may be a good choice for painters who are looking for a wide range of color choices that they can mix and match. This paint set is safe even for your kids especially since it contains water-based, non-toxic, and acid-free ingredients. You can teach your children to paint without worrying if it contains harmful substances. It’s a great starter set for people who are interested to learn this craft especially children, students, and hobby painters. 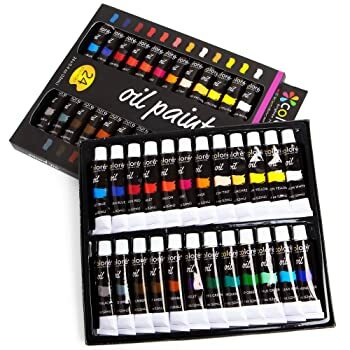 This paint set is a nice gift suggestion. Since it is affordable on the pocket, this paint set makes it suitable for practicing brushing techniques. The color palette has basically everything color your need. The tubes are a bit small. Therefore, you may empty it out sooner than expected. The paint doesn’t glide on the canvas as smoothly as it should. It takes longer to dry and the consistency is a bit watery. 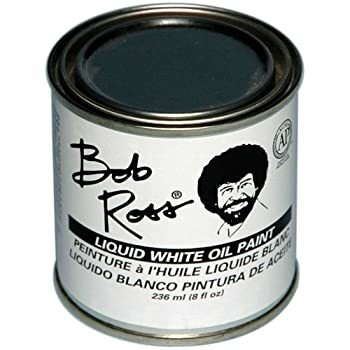 The Bob Ross Oil Paint may be appropriate for artistic painters who love working on various painting techniques. It is specifically designed for wet-on-wet brushing methods to produce a vibrant and intense color. This can of paint is formulated with non-toxic materials making it safer to use. One can of paint may cover 20 large sized canvases. There are YouTube videos available to guide you through the entire application process. Following the instructional video ensures you a successful painting project. The paint goes on smoothly on the canvas with ease and accuracy. The Bob Ross wet-on-wet painting technique is easy to follow. This makes it a fun way to learn oil painting. This paint works best on creating scenic artworks and misty effect. If you’re into scenic paintings, this may suit you well. It takes a long time to dry out the paint and sometimes even days. The paint tends to create lumps while mixing it. It’s a bit expensive for a small can. If you are looking for a good quality paint, the My Artscape Oil Paint may be a suitable choice. The paint is easy to feather out and provides a glossy shine. The colors are brilliant and glossy making any painting job look professional. The variety of colors makes it fun to play with. I used this on various surfaces in my home and the colors were very attractive. This makes it a good gift idea especially for those who are interested in learning how to paint with oil. I gave this as a birthday gift to my 16-year-old niece as a starter kit and she absolutely loved it. Now that she’s 17 years old, she is still very much into painting and is still using this brand. The paint has a nice consistency making it easy to apply on the canvas. I did not experience any issues on the application. The tubes contain small amounts of paint which sometimes may not be enough especially for bigger projects. I personally did not like the packaging because when I opened the box, the paint tubes were scattered all over. 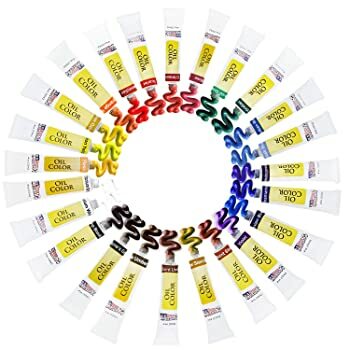 After reviewing the top rated oil paints in the market, it is apparently clear that the best oil paint goes to the Colore 24-Color Oil Paint Set. This product has an edge over its competitors in terms of features and functions. The Colore is designed with high-grade materials making it durable and tough. This type of paint is what professional painters use because the paint allows their work to be preserved for a very long time.